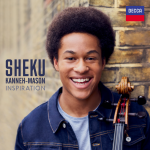 18-year-old cello player Sheku Kanneh-Mason is taking the music world by storm as he becomes this year’s best-selling British debut artist – across ALL genres – making the Top 20 in the Official UK Albums Chart with his classical album ‘Inspiration’. It has entered the main chart at No.18 and is also No.1 in the classical chart. Sheku makes chart history as the first BBC Young Musician winner to enter the Official UK Albums Chart with a debut recording, as well as the youngest cellist ever to reach the Top 20. He is also the highest-charting BBC Young Musician winner ever. 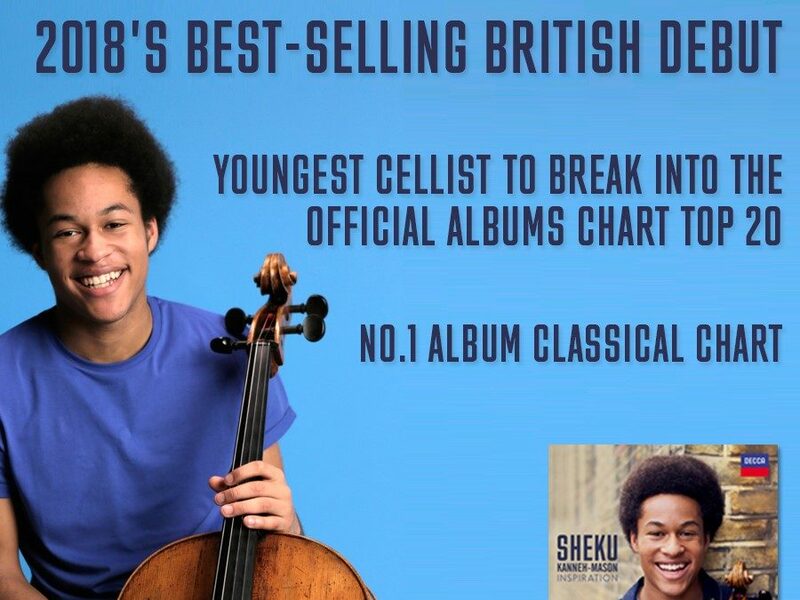 In addition, Sheku becomes the youngest classical artist to break into the Official UK Albums Chart in almost a decade (since Britain’s Got Talent star Faryl Smith’s debut in March 2009, aged 14). His first recording – which ranges from Shostakovich to Bob Marley – is in the chart alongside albums by Taylor Swift, Ed Sheeran, Rag’n’Bone Man and Fall Out Boy. Sheku’s album, released this week on Decca Classics, was recorded in Birmingham and his hometown of Nottingham with the City of Birmingham Symphony Orchestra (CBSO) and Music Director Mirga Gražinytė-Tyla. It features Shostakovich’s Cello Concerto No.1 – the piece which propelled Sheku to fame as the first black winner of BBC Young Musician in the competition’s 38-year history. As part of Sheku’s personal selection of pieces on the album, he also recorded Bob Marley’s ‘No Woman, No Cry’ in his own arrangement for cello. The beautiful version went viral worldwide – with support from the likes of MOBO and Bob Marley’s daughter who shared Sheku’s video. He is the top streamed young classical artist, racking up 2.5 million streams on Spotify alone. Sheku has been on a whirlwind adventure since winning BBC Young Musician 2016 – performing Leonard Cohen’s ‘Hallelujah’ at the BAFTAs in front of Their Royal Highnesses The Duke and Duchess of Cambridge, playing at 10 Downing Street as part of the 30th anniversary of Black History Month, making his Carnegie Hall debut in ‘The Children’s Monologues’ directed by Danny Boyle, performing for Paul Smith’s show during Paris Fashion Week and making his BBC Proms debut as a soloist with Chineke! – Europe’s first majority BME (black and minority ethnic) orchestra – with the video of his performance going viral. All this whilst completing his A-Levels, graduating from Trinity School in Nottingham and starting his studies at the Royal Academy of Music in London. Sheku will be returning to the BAFTAs on 18th February – the first time an artist has ever been asked back to perform. He will be joined by members of his talented musical family (all 7 children play instruments to a phenomenally high standard) in what is sure to be another spine-tingling moment. Copyright 2018 Enticott Music Management. All rights reserved. Management in association with IMG Artists.